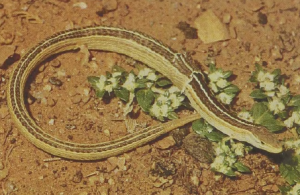 The girdle-tailed lizards would seem to be the least likely species to have limbless relatives; this makes the present assemblage of South African snake lizards so interesting. Perhaps four species of the elongate (16- to 25-inch) Snake-like Girdle Tails have been described. These show a gradual progression from five digits to two, to one, while the last species lacks any external front limbs. The scales of the body are heavily keeled and the keels align into ridges. Clearly these animals are not borrowers. Instead they resemble some of the Australian pygopods in inhabiting grass tussocks where they hunt small insects and other animal prey. Like the zonures, but unlike the flat lizards, these elongate cordylids hold their eggs until ready to hatch.